The Fig. 517 Steam Jet Vacuum Pump operates on the steam jet principle, utilizing the energy of steam to create vacuum and handle process gases. Steam under pressure enters at the nozzle and produces a high velocity jet. 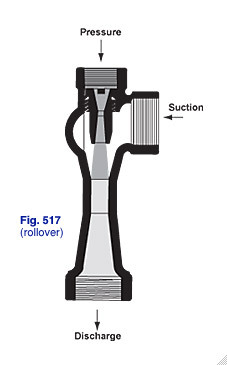 This jet action creates a vacuum that draws in and entrains the suction gas. The mixture of steam and gas is discharged at atmospheric pressure. The simple design prevents solids from collecting and clogging the action. Also, pressure drop in the suction chamber is held to a minimum. The Fig. 517 Steam Jet Vacuum Pump is low in initial cost, but has lower efficiency than the Fig. 430. It has a streamlined, one-piece body, with no moving parts to wear or break, nothing to get out of order, and does not require extensive maintenance. Exhausting, evacuating, and general vacuum service. For more detailed information about Steam Jet Vacuum Pump, Bulletin 4E Literature. To submit a Request for Quote (RFQ) for Steam Jet Vacuum Pump, Adobe PDF or submit an online interactive RFQ Form for Gas Jet Compressor / Thermocompressor.